by Simon, Albert F., Miller, Anthony A.
Simon, Albert F., Miller, Anthony A. THE OUTLINE REVIEW THAT DELIVERS . 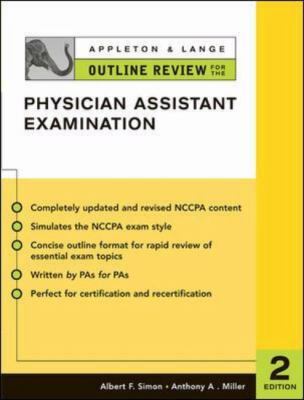 . . *Higher scores with the authors' proven exam prep method *Easy-to-follow outline format for quick review of essential exam topics *Concise overview of diseases, emphasizing recognition and treatment *Simulation of the NCCPA exam format *Chapter on each clinical area *NEW CHAPTERS on Infectious Disease and Surgery *Comprehensively updated coverage based on the very latest NCCPA content *Perfect study guide for clinical rotations THE MOST EFFECTIVE, TIME-EFFICIENT, AND CONCISE WAY TO PREPARE FOR THE NCCPA CERTIFIYING OR PANRE RECERTIFYING EXAMS *Targets the important facts *Learn more in less time *Written by PAs for PAs *Builds confidence, skills, and knowledge *From the quick-study expertsSimon, Albert F. is the author of 'Appleton & Lange Outline Review for the Physician Assistant Examination', published 2003 under ISBN 9780071402897 and ISBN 0071402896.